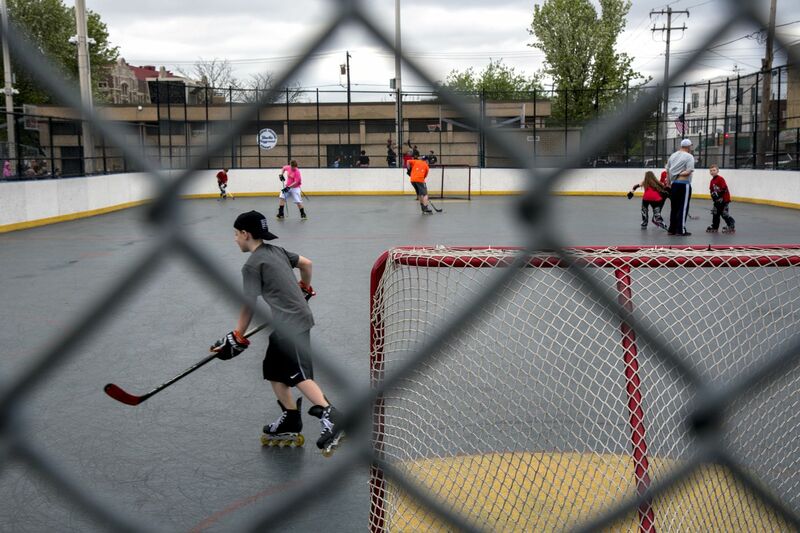 Youngsters (no IDs) play on the hockey rink at the Burke Playground April 14, 2019. Since 2014, Philadelphia City Councilman Mark Squilla has directed $23,000 in public money to the Burke Community Fund, a nonprofit named for the playground. The fund has never been audited and in 2010, the IRS revoked its charity status for failure to file a tax return since at least 2007. The Philadelphia Activities Fund, a nonprofit arm of the Department of Parks and Recreation, was established 25 years ago as an independent overseer for community funding requests. The goal was to end the ethically fraught practice of letting Council members choose which groups in their districts deserve money. In the years since, the fund has distributed tens of millions of dollars. Where does the money go, exactly? An Inquirer review suggests there’s been little, if any, oversight of the fund and individual council members still decide who gets the money. And it’s not just not-for-profit groups. Philly’s laws are set by 17 people on City Council. This year, dozens of people are running for a spot. In such a crowded race, fund raising can set a candidate apart. So can age, as a group of millennials vie to be the first on the Council. But what about the issues? We asked incumbents and challengers what their first proposed bill would be if they win their party nomination May 21 and the general election this fall. Their answers touch on everything from tax abatement to rent control. Mass shooting events in suburban settings involving multiple victims shot by the same person devastate communities and get a lot of public and political attention. Shootings in Philadelphia often take place in different neighborhoods and involve different residents but send multiple patients to the same emergency room at once. These patient clusters can be as devastating for communities and hospitals as single-site mass shootings. And when clusters are considered, a new study from Temple University has found that Philly has seen an average of nearly two mass shootings every month for the last 11 years. The final clean up of the nuclear reactors at Three Mile Island may not be completed until 2079, nearly a century after the infamous accident there. Here’s why it takes so long and where the nuclear waste will go. Three U.S. Marines were killed in Afghanistan last week, and two had ties to our region. For communities in York County and Harrisburg, their deaths are a reminder of America’s longest war. Gov. Phil Murphy signed the Medical Aid in Dying bill Friday, allowing terminally ill patients in New Jersey to request prescriptions from their doctors for medication to end their lives. A mailing address is often the key to obtaining identification for employment and housing. Thanks to Broad Street Ministry, people experiencing homelessness can have one, and a lifeline. How important is tonight’s Sixers-Nets rematch in Game 2 of their playoff series? Let’s just say the Sixers have never come back to win after starting 0-2. History says John Wilkes Booth, the assassin of Abraham Lincoln, was killed in a Virginia barn by a Union soldier in 1865. But 21st century technology says he may have gotten away. It’s Tax Day, which means CPAs and the IRS are really busy — but so are tattoo artists. Inquirer TV critic Ellen Gray has some thoughts about last night’s Game of Thrones premiere, but they are spoiler-filled and should be avoided at all costs if you haven’t watched yet! Jonesing for a new dining experience? Well, I hope you’re hungry: the next three months or so are chock full of restaurant openings in the Philadelphia region. It only took 14 innings, seven relief pitchers, and a two-run homer from Jean Segura, but the Phillies finally bested the Marlins Sunday, 3-1. As Toll Brothers eyes the historic Jewelers Row for a new high rise, columnist Mike Newall remembers his time bartending for all the characters he met there. If you’ve long been fascinated with the Ardrossan estate in Villanova, and the family that inspired The Philadelphia Story, then a new book about their hidden lives is for you. “This shared grief reminds us of the extent to which an independent bookstore is rooted in its community. Like a plant, it’s shaped by its environment. ...The Penn Book Center is truly a collaboration between us and our customers.” — The owners of Penn Book Center on reactions to the closing of their independent bookstore. Affordable summer camps funded by Philadelphia’s Parks and Recreation department are a lifesaver for working parents, writes Marcella Lipski, a full-time mom and part-time marketing data specialist for HDR Architecture Inc. The Democratic presidential hopefuls radiate unseriousness about the things they speak solemnly of, writes columnist George Will. Spring means it’s golf season in our neck of the woods, and just in time Chestnut Hill Local has a look at how the “Father of American Golf” came to Chestnut Hill. Speaking of local history, Curbed Philly has gone inside the fight to save a Louis Kahn creation in East Norriton, Pennsylvania. Fans of preservation and architecture shouldn’t miss it. Spend some time today with a truly moving essay about the struggles of aging and one Philadelphian’s relationship with his mother, via Philadelphia Magazine. The Marshall Project has published one woman’s account of having access to money in prison and it throws into sharp relief the fate of those without such luck. It’s a must-read. If you use the internet (ahem, yes, you) you need to read The New York Times’ report on how location data Google collects from cell phones is being used by law enforcement. John Czerw pulls a kielbasa from the smokehouse at Czerw's, Tilton Street. Easter is a busy time at Czerw's, Swiacki's, Stock's, and other fixtures of Port Richmond's Polish comunity. It’s almost Easter and, in Pennsylvania’s Polish communities, that means it’s time for kielbasa. Lots and lots of fresh kielbasa.